Welcome to another week which has seen several positive announcements and developments, both in the local market and elsewhere, along with Laurel Brunner’s Verdigris Blog and a couple of new additions in Online Features. If you haven’t yet downloaded the PDFs from HP with regard to its latest inkjet developments and direction, you should. I think they give a good indication of what to expect in the future in our own industry.Don’t forget that next week will see FESPA Africa kick off on 2 July at the Gallagher Convention Centre in Johannesburg, along with Africa Print, whereas Sign Africa and Visual Communications Africa are both incorporated into FESPA for this year’s event. You’ll find all the news in the FESPA Newsroom on the Website, and the most recent announcements also below.Monday was covered in last week’s update, but to remind you, it began with the announcement from Agfa and Thunderbolt Solutions. In order to return to a Monday – Friday week, I have repeated last Monday’s news below, as next Monday will see our last update until August. I need break during July for a change. The best of this week’s new happenings and events that I am aware of can all be found below. There have been some really good ones over the past week, including major achievements from Kodak as the first Kodak Prosper 6000C commercial press beta installation is announced at Japs-Olson; from QuadTech with a first in Israel at CLP; from Agfa with 48-page CTP and workflow in Germany; and from Rotolito Lombarda with a Manroland Web Systems 48-page Lithoman with Kodak Stream Inkjet; a Manroland FoldLine for the company’s HP Inkjet Web Presses, and an HP Indigo 10000 B2 Digital Press for book covers – all on Tuesday. Wednesday saw Sappi Ngodwana Mill’s Specialised Cellulose expansion officially opened in Mpumalanga; as well as a major new software release from Esko of its Suite 14; while on Thursday, Manroland Web Systems took the lead with a new 48-page Lithoman for Aller Tryk in Denmark. Friday began with FESPA Africa which has already been mentioned above, and with the major news coming from HP with the world’s first three installations of its new monochrome HP T260 inkjet web presses to meet demands of the China publishing market at three of Hucais’ printing centres. Leading today’s headlines: Graphic Label Solutions breaks new ground in sustainability with the first EFI Jetrion LED inkjet narrow web press in the United States. This is followed by KBA at Chesapeake/MPS in the UK with a Rapida 106 B1 press as the ‘cornerstone’ of a £3m investment programme. You’ll also find Horizon with its latest from IFS at B3 printer Herts & Essex, also in the UK. A double tailender for you this week to make up for missing out last Monday. UPM Kymmene with WWF Finland on Thursday with the promotion of sustainable wood-based biofuels, sustainable forest management and sourcing of raw materials in Finland; and again today, as it signs an agreement for the distribution of UPM BioVerno renewable diesel produced in UPM’s Lappeenranta Biorefinery in Finland. There’s lots more lower down, including some exciting new software releases. Our e-News comprises: Headline News – Online Feature Articles – the Verdigris initiative from Digital Dots. 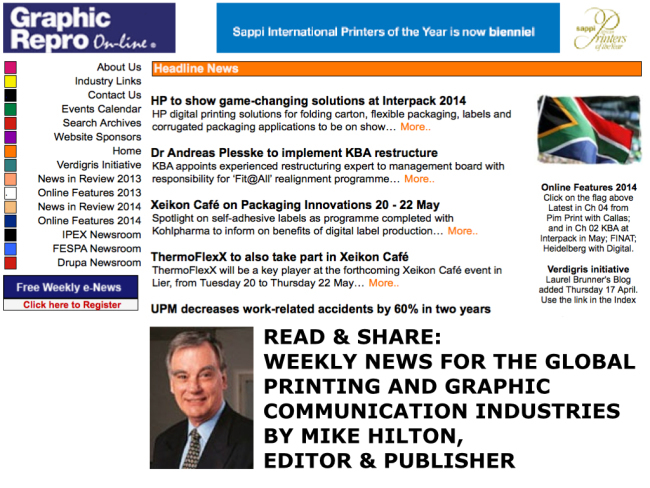 Our Ipex, Drupa and FESPA Newsrooms can be accessed from the Index on our Home Page, as well as News in Review, which provides a weekly overview and listing of all news added to the site. Over 25,000 news items have now gone online since we launched our Website in September 2001. News for the past 24 months can still be accessed via the Home Page and its continuation news pages Note: ‘next page’ and ‘previous page’ links appear at the top of each News continuation page. Thunderbolt Solutions and Agfa agreement for distribution, service and support of Agfa Graphics range of products in Southern Africa…Disruptive Approach? Make it better by ‘Make it matter’! Onyx Graphics has launched a new addition to its award-winning suite of RIP and print workflow products…. Heidelberger Druckmaschinen AG (Heidelberg), The world’s largest printing press manufacturer for the industry worldwide. Heidelbergcustomers enjoy the most comprehensive and extensive sales and service network in the industry for JDF compliant workflow, computer-to-plate, sheetfed offset, Web-to-print, digital printing, digital inkjet for labels and packaging, packaging and finishing, all with complementary consumables.Heidelberg has offices in around 170 countries. Visit the Heidelberg Website for more information.Electronics For Imaging(EFI) is a world leader in digital imaging and print management solutions for the commercial printing market. Its portfolio of integrated solutions span production and superwide format printing, graphic arts, advanced professional printing software, and industrial inkjet systems. Its technologies increase productivity by automating print and business processes To find out more visit the EFI Website.Kodak Commercial Imaging (Kodak) is a leading provider of innovative solutions for conventional, digital and hybrid print production environments. With the most expansive portfolio for the graphic communications market, Kodak features technologies, products and services that help print providers streamline processes, optimise efficiencies, broaden services, and grow businesses. To find out more, visit the Kodak Graphics Website. There have been 50 so far this year, as well as seven downloads. There were 92 articles in 2013 which can still be accessed via the Index on the Home Page, with prior years’ via Search Archives (option 2) on the Website. Ideas for new business models – customers encounter special applications for folding machines at Heidelberg Postpress Special Folding Days in early June…Previous… Disruptive Approach? Make it better by ‘Make it matter’! Access via our Home Page Index. Can be found in the Index on our Home Page. Our Drupa Newsroom with news from Messe Düsseldorf and for Drupa 2016 can be found in the Index on our Home Page. The Graphic Repro On-line Website is supported and sponsored by:Antalis South Africa, Dainippon Screen, Drupa 2016, EFI and EFI Vutek, Esko, Epson Europe BV, FESPA. Goss International Inc, Heidelberger Druckmaschinen AG, HP Graphic Solutions, Kodak, Koenig + Bauer AG, Kemtek Imaging Systems, Konica Minolta, Krause-Biagosch, Leonhard Kurz Stiftung, Manroland Web Systems GmbH, Muller Martini AG, POLAR-Mohr, QuadTech Inc, Quark Inc, Ricoh Europe, Sappi Limited, Sappi Printers of the Year, Print Process Champions Group, Thunderbolt Solutions, and UPM-Kymmene. published by Mike Hilton, graphicrepro.net, PO Box 10 Peterburgskoe Shosse 13/1, 196605 Pushkin 5, St. Petersburg, Russia.